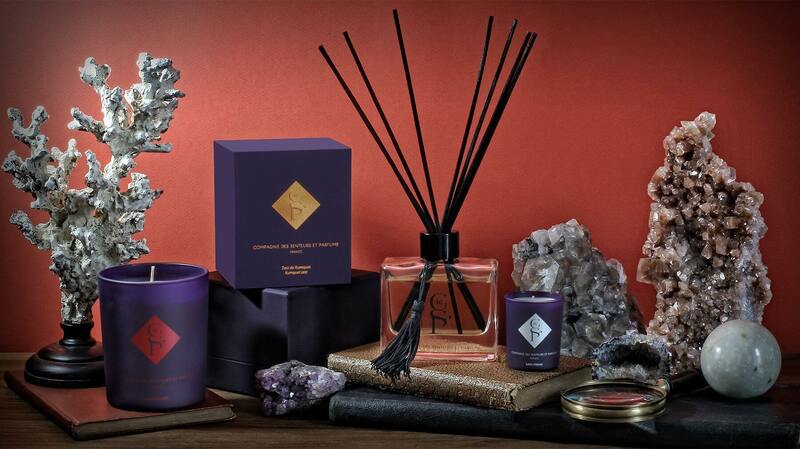 A range of brand new, elegant fragrances from beautiful and sophisticated designer objects. Far more than just a candle, the Compagnie des Senteurs et Parfums is offering an authentic sensory experience. The products are inspired by designer fashion as well as art and history; the illustrations are discreet yet luxurious. The fragrances collect in precious cases, drawing inspiration from the traditions of high perfumery and offering escape on a high-end, scented journey. Tonka bean and coffee blend in a spicy note, fading ahead of sweet vanilla and musk before giving way to the woody notes of patchouli and cedar. The first saffron note quickly gives way to the opulence of rose which intertwines voluptuously with the precious woody notes of agarwood and sandalwood. Notes of saffron, cinnamon, jasmine and incense take us on a journey to the East, balanced by vetiver, leather and patchouli. Nutmeg, cinnamon and clove exude spicy notes which combine with leather and the sweetness of honey and tonka bean for a wonderfully balanced fragrance. The bergamot and orange notes gradually fade to make way for tea and osmanthus flower, ending in a wooded world of cedar and vetiver. Iris, jasmine and orange blossom create a fragrance which celebrates love, with delicious fruity and vanilla accords giving way to the sensuality of musk and patchouli. White rose and lily combine in a majestic bouquet, enhanced by green and fruity notes for a welcome freshness. Cheerful and lively, the citrus notes of lemon and bergamot enveloped in white musk toy with the deliciousness of red berries, raspberry and blackberry. Vanilla, musk, amber and cedar create a candle with a bewitching, sensual and warm fragrance. A world of gentle sweetness for the senses. Buren’s columns, stripes, yin and yang… Black and white are weighty symbols and two opposing colours – or perhaps two values? The struggle between light and dark, the embodiment of perfect harmony: a strong and sophisticated design statement. The Black & White collection boasts nine fragrances with their own unique personalities: Mahogany, Agarwood Ink, Oriental Sand, Royal Mall, Osmanthus Infusion, Secret Flowers, Rose and Lily, Fruity Musk and Imperial Vanilla. 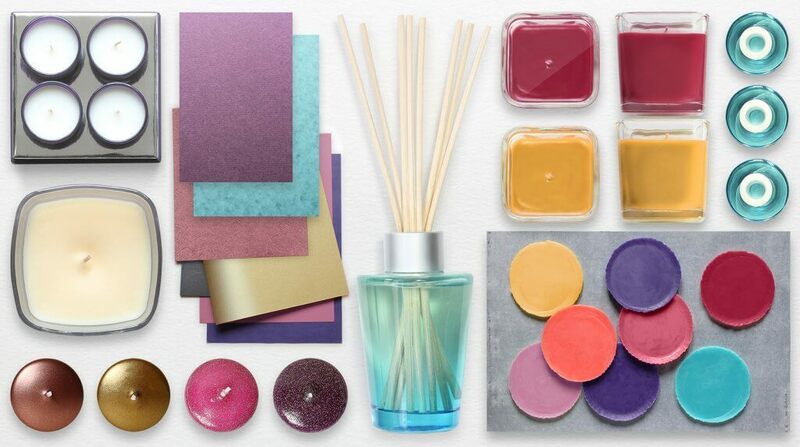 Intoxicating and captivating fragrances made from noble ingredients. The very height of elegance. Recognisable with its iconic stripes, a magnificent, sleek and minimalist set of three miniature versions of Mahogany Wood, Agarwood Ink and Oriental Sand. Rose and Lily, Osmanthus Infusion and Imperial Vanilla in a set where pure white represents purity, contrasted by the collection’s characteristic stripes. 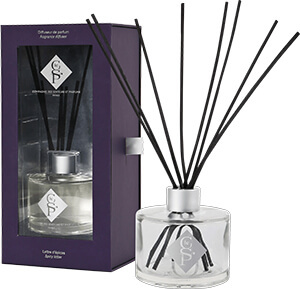 The Black & White collection is available as a perfumed reed diffuser set with a design as elegant and refined as the candles. Available in Secret Flowers, Imperial Vanilla and Royal Mall. The glass bell perfectly showcases the elegance of the candles in the Black & White collection. Present the candles from the Black & White collection on an elegant wooden tray. The natural colour contrasts with the two-tone candles. The spicy and exotic notes of nutmeg, cinnamon, elemi, coriander and tonka bean combine to create an enchanting and woody scent, blending birch, pine and cedar. The Fig in the Breeze candle exudes a refreshing scent with notes of sap, fig leaves, white sandalwood and coumarin. Pomegranate, wild blackberries and blackcurrant make up a fragrance with delicious, sweet notes highlighted by a praline accord. Playful notes of bergamot, grapefruit and pink peppercorn give way to a complex and subtle accord of cinnamon, leather, tobacco leaves and balms. White flowers and spices mingle in a sensual fragrance that combines ylang-ylang, jasmine, rose, cinnamon and chilli pepper. 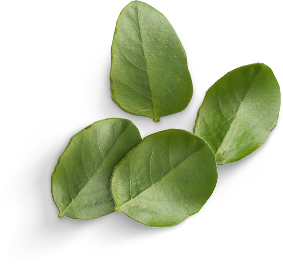 The base notes are vanilla, benzoin and patchouli. Loaded with energy, this fragrance begins with lively grapefruit and orange notes, followed by the acidity of kumquat combined with the sweetness of mango and apricot. A case as soft as silk with a minimalist design: a unique colour, highlighted by discreet metal inscriptions. A complete sensory experience, where touch compliments beauty before revealing a precious fragrance. Indigo is a noble pigment, the colour of kings and renowned artist Yves Klein. Here, it permeates a collection that once again illustrates the definitive secret of chic: simplicity. The six fragrances in the Indigo collection combine precious essences for an extraordinary escape through fragrance. Discover the unique scents of Cedar, Fig Tree in the Breeze, Ruby Pomegranate, Spiced Letter, Arabian Secret and Kumquat Zest and dive into an intoxicating perfume world. 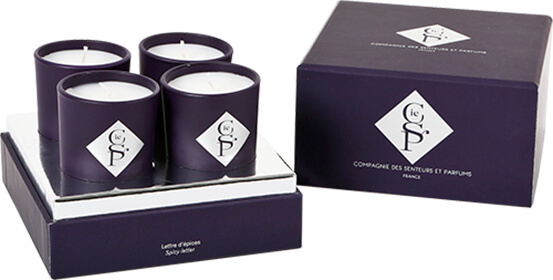 An elegant set of four miniature Spiced Letter candles, with a chic and elegant design typical of the Indigo collection. Kumquat Zest, Ruby Pomegranate and Spiced Letter fragrances are available as reed diffusers, in a beautiful box with an elegant minimalistic and sophisticated design..
With a diameter of 10cm, the glass bell is ideal for presenting candles from the Indigo collection, perfectly highlighting their delicate aesthetics. Ideal for presenting all the candles in the Indigo collection together, this tray in pale wood creates a warm contrast. Entirely manufactured in France, the Compagnie des Senteurs et Parfums collection is a showcase for impeccable quality. The wax and wicks are carefully selected for their uniformity and the fragrances are from Grasse, legendary perfume capital of the world. Inspired by historical, artistic, cultural and social references, both collections from the Compagnie des Senteurs et Parfums were designed like fashion collections. 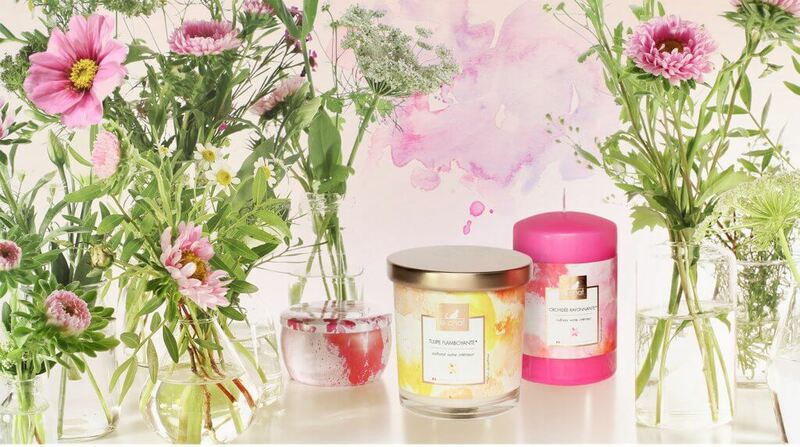 They evoke elegance, from the minimalistic yet bold aesthetics to the delicate and original fragrance choices. 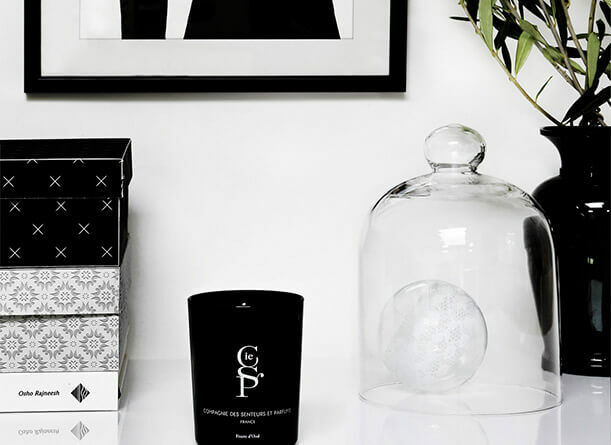 The bewitching power of alternating black and white, the depth of strong, plain colour… Discover exceptional products which open the door to a fabulously fragrant universe and a world of uncluttered lines.